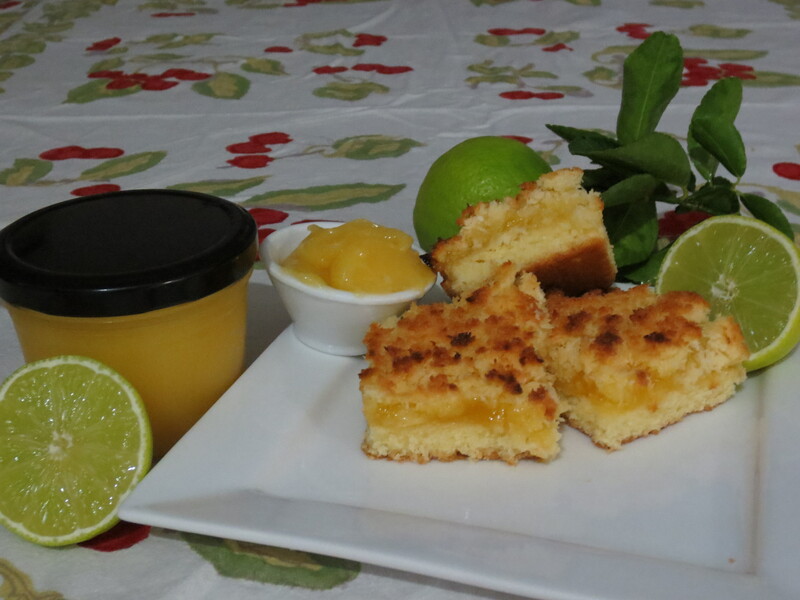 This recipe was originally a gluten Lemon Coconut Slice which I have adapted to GF and used limes which I have in abundance. If you have heaps of the fruit, you can also make jars of the curd and refrigerate it until it is needed. Preheat oven to 180 degrees C. Grease and line the base and sides of a 19 x 29 cm slice pan with baking paper, allowing the long sides to overhang. Using and electric mixer, beat the butter and sugar until combined. Add egg and beat until combined. Add egg and beat until just combined. Add the flour and coconut, and stir with a wooden spoon until mixed. Spoon mixture into the prepared pan and smooth the surface with the back of a spoon. Bake in the oven for 15 minutes or until golden. Meanwhile, make the lime curd. Combine the butter, sugar, egg, lime rind and juice in a small saucepan over medium heat. Cook, stirring for 5 minutes or until mixture boils and thickens. Remove from heat and set aside to cool slightly. Spread the curd evenly over the prepared base. Next make the coconut topping. Use a fork to whisk the eggs and sugar in a medium sized bowl. Add the shredded and desiccated coconut and stir until well combined. Sprinkle evenly over the lime curd. Bake in oven for 20 – 25 minutes or until the coconut is lightly golden and set. Set aside in pan to cool completely. Cut into squares to serve.